We are looking for photos, postcards, documents, letters and whole biographies to include them into a planned museum and information center for Jewish heritage in Kaliningrad / Königsberg. The next exhibition and the accompanying publication will describe the fates of the Jewish families in Königsberg from the beginning of the 20th century until they left the city, or until they were persecuted, fled or annihilated. We are also working on a database of people from Königsberg and would like to collect as much material as possible and make it centrally accessible as an information centre and library for the current inhabitants of Kaliningrad and for descendants from Königsberg living all over the world. Currently, the historically unique process is taking place that a magnificent synagogue destroyed in November 1938 is being built on the same site after 80 years by a Jewish community that has blossomed again on its own initiative. This encouraged us to concentrate our historical research in recent years on the Jewish community of Königsberg and, in addition to today’s event, to hold an exhibition on the history of the people at the time of the construction of the great synagogue. 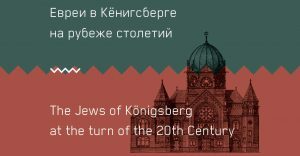 2017 November we organized an exhibition on “Jews in Königsberg at the turn of the century”. This is the first exhibition and the accompanying exhibition catalogue that were conceived especially for the Kaliningrad public and presented previously unknown source material in words and pictures about the history of Jewish society at the time of the construction of the Lindenstrasse Synagogue around 1896. In addition to archival sources from Jerusalem, Berlin and Olsztyn (Poland), private photographs of descendants of Königsberg Jews, who now live on all five continents, were also presented. The next exhibition continues the story of the first exhibition. If you could contribute to this project, we would be very glad. We thank you in advance for every support that you can give us. Juden in Ostpreußen. Verein zur Geschichte und Kultur e.V.